Make sure your flashlight will handle these. WARNING: 1. Don't heat,incinerate or reverse polarity. Specifications: Size:about33.5 16 16mm Color:blue. WARNING: 1. Don't heat,incinerate or reverse polarity. Model : 16340( Replace for CR123A,, K123A, VL123A, DL123A, SF123A 123A ). Capacity: 1200mAh. of lithium is not a failure but scrapped. 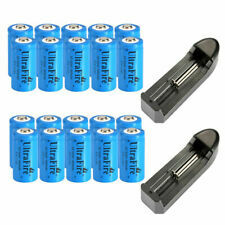 Material: Li-ion Battery. lead scrap. Make sure your flashlight will handle these. Model : 16340( Replace for CR123A,, K123A, VL123A, DL123A, SF123A 123A ). Capacity: 1200mAh. of lithium is not a failure but scrapped. 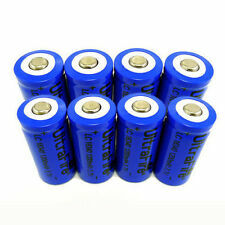 Material: Li-ion Battery. lead scrap. Don't heat,incinerate or reverse polarity. 16340 Battery. 4x 16340 Battery. Capacity: 1200mAh. Parcel with batteries usually takes. Charging Temp: 0 - 45°C. Size: Ø16mm x 34 mm. Model : 16340( Replace for CR123A,, K123A, VL123A, DL123A, SF123A 123A ). Capacity: 1200mAh. of lithium is not a failure but scrapped. lead scrap. 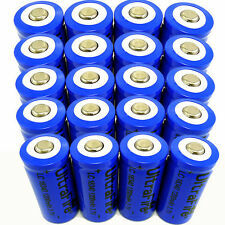 Material: Li-ion Battery. Mark Capacity：880mAh. Model：16340. Type：Lithium Ion. Model : 16340( Replace for CR123A,, K123A, VL123A, DL123A, SF123A 123A ). Capacity: 1200mAh. of lithium is not a failure but scrapped. lead scrap. 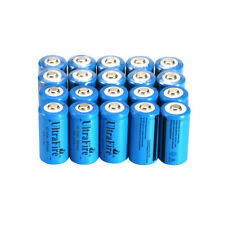 Material: Li-ion Battery. Size:about33.5 16 16mm. Don't heat,incinerate or reverse polarity. Trending at $5.35eBay determines this price through a machine learned model of the product's sale prices within the last 90 days. 100% Brand New, 100% Original Ultrafire Products Reliable and Durable, Quality Guranteed. 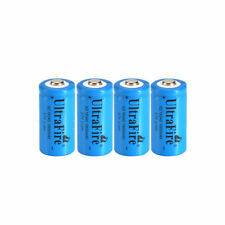 Fake / Cheap batteries may damage your flashlight / charger 100% Brand New Li-ion Rechargeable batteries Ultrafire 16340 3.6v 880mAh Can replace for CR123, CR17345, K123A, VL123A, DL123A, 5018LC, SF123A and EL123AP) The voltage of full charge & empty condition is 4.2v & 2.75v respectively Can be recharged over 500 times Protection kicks in : 2.75v and 4.2v Over-Charging / Draining at 4.2v / 2.75v Maximum Charge / drain rate : 1.5C Internal resistance : <= 120m ohm Charging Temp : 0 - 45C . 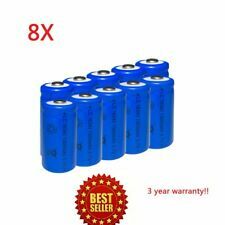 8x 3.7V 1200Mah 16340 Batteries. Specification of Battery. 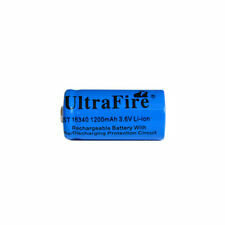 100% Brand New, 100% Original Ultrafire Products Reliable and Durable, Quality Guranteed. 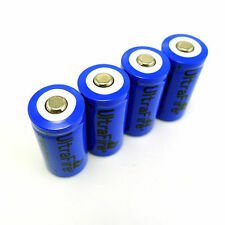 Fake / Cheap batteries may damage your flashlight / charger 100% Brand New Li-ion Rechargeable batteries Ultrafire CR123A 3.6v 880mAh Can replace for CR123, CR17345, K123A, VL123A, DL123A, 5018LC, SF123A and EL123AP) The voltage of full charge & empty condition is 4.2v & 2.75v respectively Can be recharged over 500 times Over-Charging / Draining at 4.2v / 2.75v Maximum Charge / drain rate : 1.5C Internal resistance : <= 120m ohm Charging Temp : 0 - 45C Package includes:. » Model : 16340 LR123A ( Can replace for CR123, CR17345, K123A, VL123A, DL123A,5018LC, SF123A and EL123AP ). » White 16340 Battery x8. » Capacity: 2200mAh. » Protective circuit inside: protect from overcharging.